Aruba is an island in the Caribbean Sea and is one of four countries that form the Kingdom of the Netherlands. It’s location in the southern part of the Caribbean ensures warm and dry weather all year round. Unlike most other tropical Caribbean destinations, Aruba is far enough to the south to be outside the hurricane zone. This makes it a safe bet for sunny weather just about any time of the year. Its dry cactus-strewn landscape more closely resembles Arizona than the usual lush green environments common in most Caribbean islands. 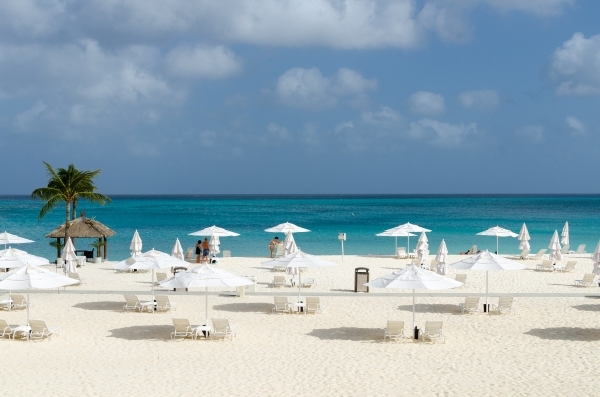 The white sandy beaches of Aruba are some of the most beautiful in the world. 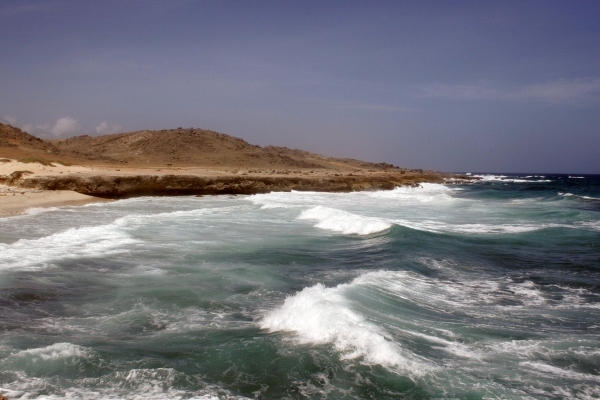 The island’s southwest side is protected from the wind and is the most populated. The northeast side of the island is exposed to strong trade winds and is less popular with beachgoers, although perfect for exploration or windsurfing. 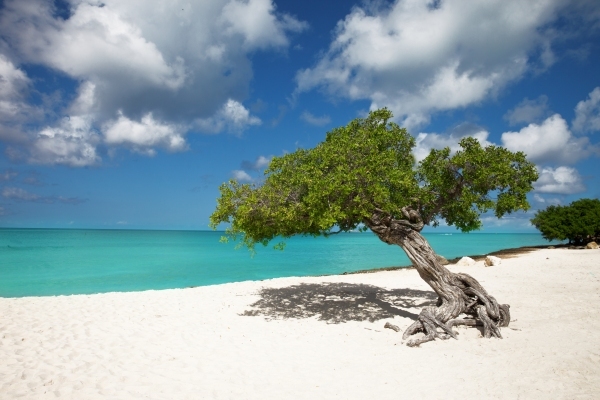 The average daily temperature in Aruba is consistently between 78F (26C) and 88F (31C). The months of September to October tend to be the hottest as the winds die down, making it the best time to find travel bargains while fewer people vacation in Aruba. This could be a great opportunity if you enjoy hot sunny days at the beach. The official languages in Aruba are Dutch and Papiamento. However, due to tourism, English is spoken by most locals so it is very easy to communicate. Driving a car in Aruba is the same as in the US. 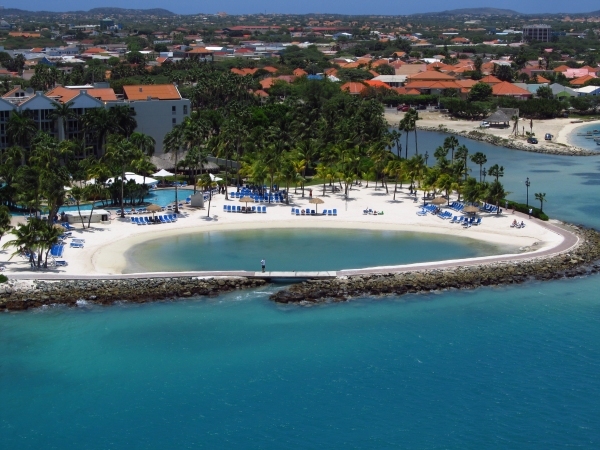 Aruba’s main point of entry is Queen Beatrix International Airport, located near the capital city of Oranjestad. Flights from North America are about $600-900 during peak season, but better deals are available if you find a last minute travel package. The airport is busiest on weekends between Friday and Sunday because many vacation goers check in and out at this time. Wednesdays are the quietest travel days if you have flexibility in planning your vacation. 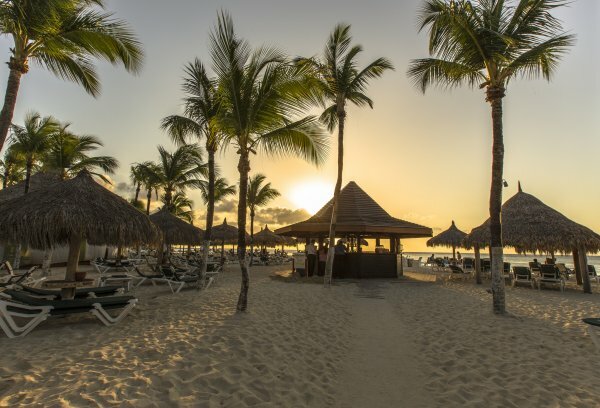 If you’re planning a beach honeymoon, you’ll have plenty of options in Aruba. Palm Beach is a tourism district just northwest of Oranjestad. There are several high-rise resort hotels in the area and plenty of nearby shopping and restaurants. The sugar white beach is perfect for a day of activities, and the area has a lively nightlife with a great choice of casinos, restaurants and bars. Just south of Palm Beach are the world famous pristine white sands of Eagle Beach. Eagle Beach is one of the most beautiful white sand beaches in the world and is a great backdrop for wedding or honeymoon photos. Druif beach located just south of Eagle Beach, is a gorgeous long narrow stretch of white sand perfect for relaxing. It’s a bit quieter than the Palm Beach area, but still not too far from town. One of the most popular beaches in Aruba is Baby Beach, considered by some to have the hallmarks of a true Caribbean paradise. It’s located at the southern end of the island and is located in a calm lagoon. The water is shallow enough to stand waist deep for several hundred feet and is safe for young children to swim. It’s an ideal beach for romantic couples to float calmly in the water while enjoying each other’s company. For kite surfers, the best beach in Aruba is Boca Grandi on the southest end of the island near San Nicolas. The waters and winds are much rougher here so it is not recommended for swimmers. If you’re looking for a secluded beach untouched by the markings of tourist resorts and shops, look no further than Grapefield Beach on the southeast end of Aruba. Be forewarned that the waters are rough in this part of the island and swimming is at your own risk. You’re not likely to see many tourists here so it’s a perfect spot to get away and see nature relatively undisturbed. Just be prepared as there are no amenities like public restrooms or places to buy food. Of course there are many more beaches to explore in Aruba if you have the time. There are several places to stay in Aruba, from beautiful vacation rentals, to large luxury resorts and anything in between. If you’re looking for a bit more privacy and self-service, a vacation rental is the way to go. Aruba has a wide array of gorgeous private vacation properties available for rent by their owners. It’s relatively easy to find one using a site like Flipkey or VRBO. 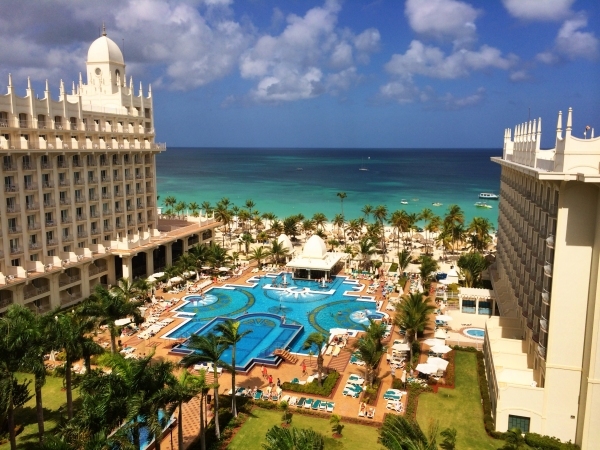 If you’re interested in a big casino resort experience, the Hyatt Regency Aruba,Marriott Aruba Resort & Stellaris Casino or Radisson Aruba Resort, respectively, from most to least expensive are highly recommended. Bucuti & Tara Beach Resorts is a good option if you’re looking for a quieter beach hotel. The Manchebo Resort is also very highly rated and has its own private beach adjacent to Eagle Beach. 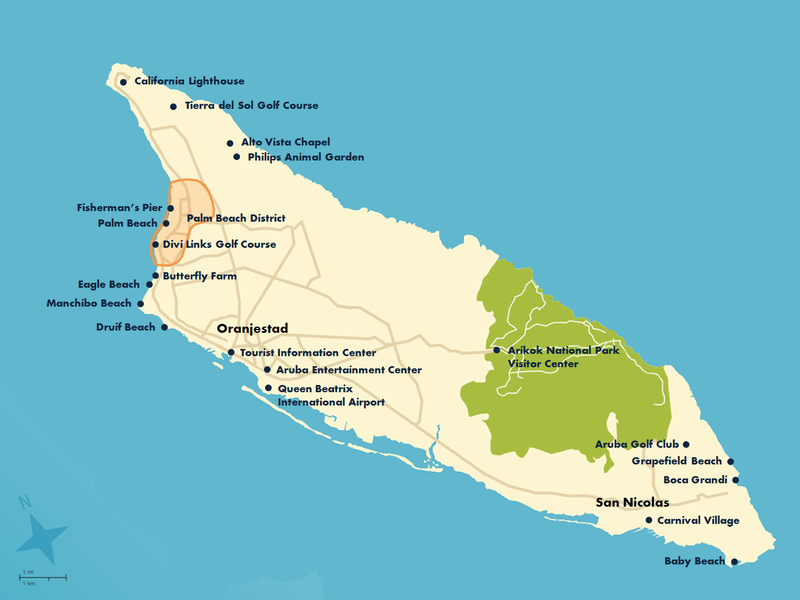 The majority of the tourist resorts and hotels are located on the northwestern side of the island, north of Oranjestad, or near San Nicolas in the southern end of the island. Keep in mind that the island is relatively small at about 20 miles in length. Driving from one end of the island to the other only takes about 30 minutes and you’re never too far from a beach. 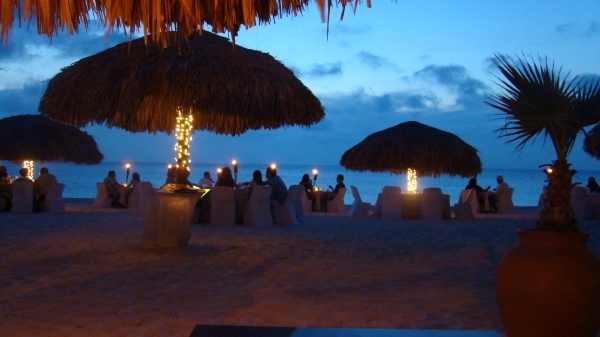 Due to its popularity as one of the preeminent tropical destinations, there are no shortages of outstanding restaurants in Aruba. One of the most highly regarded fine dining options is Barefoot, a casual restaurant where you can eat on a beautiful beach setting while wearing your comfortable flip flops. Madame Janette is another excellent and well established choice for casual fine dining. It’s enjoyed by many locals and has a fresh and changing menu based on grilled meats and local fish, as well as pasta. The Flying Fishbone offers an “on the beach” dining experience which is perfect for a romantic dinner. Their menu is varied and based on the fresh ingredients of the day. If you’re looking for a simple yet delicious pizza meal, look no further than Pizza Bob’s Restaurant & Pub located between the Costa Linda Beach Resort and the Bucuti Beach Resort. 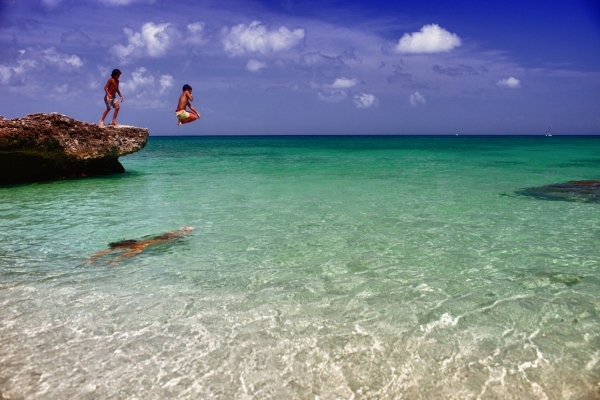 Aruba is an ideal place for island exploration day trips. Arikok National Park is located in the northeast side of the island and protects 18 percent of the island as a rich wilderness habitat. Knowledgeable park rangers can be booked at the visitor’s center for bird watching or nature walks. A common activity is to hike to the breathtaking northern coast. Wind sculpted caves formed by the constant trade winds offer an interesting visual phenomenon. Natural Pool is a beautiful rock formation on a deserted stretch of coastline. The volcanic stone circles form a small depression creating a tranquil pool of water. The holiday of Carnival is important in Aruba and can be a good time to visit. The Carnival Celebration starts from the beginning of January until the Tuesday before Ash Wednesday (usually toward the end of February). There are daily activities throughout the festival including music and parades with a spectacle of beautiful colorful costumes. The events are usually located around central meeting places like the Aruba Entertainment Center in Oranjestad, or Carnival Village in San Nicolas. The Carnival always culminates with a grand parade and the burning of “King Momo”, a symbol of the flesh. The Annual Soul Beach Music Festival is a five five-day festival taking place on Memorial Day Weekend each year in May. The festival puts on several concerts and comedy shows throughout the weekend, but these are ticketed venues so advance planning is recommended. The music festival was voted one of the best celebrations in the Caribbean by USA Today. However, you may want to avoid this weekend if you’re looking for some quiet time and want to avoid the crowds on your vacation. Visiting the island’s Butterfly Farm is a great choice for a family vacation, or if you’re a nature lover. The farm is one of two in the Caribbean, the other being in St-Martin. The farm is home to hundreds of butterfly species from around the world including the Blue Morpho, Caribbean Longwing and Monarch. It is possible to handle the caterpillars and butterflies with guidance from the staff. Daily tours are offered and last about 15 to 20 minutes. Philips Animal Garden is a non-profit organization that rescues abandoned exotic animals from Aruba and its region. The animal sanctuary has been open to the public for a couple of years and charges a modest entry fee. The sanctuary is home to a surprising collection of over 50 types of animals including tropical birds, ponies, deer, alpaca, bengal cats, ocelots, monkeys and various reptiles, to name a few. 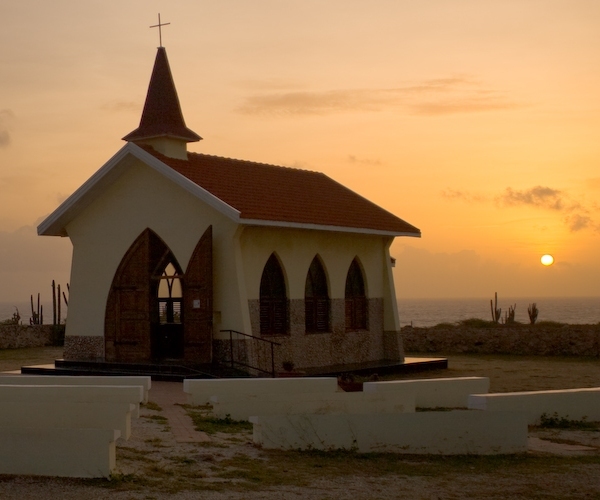 It is located near the Alto Vista Chapel, which is another popular attraction in Aruba and could easily be visited on the same daytrip. For the more active, there are many exciting activities such as windsurfing, golf, ATV tours or sailing cruises around the island. 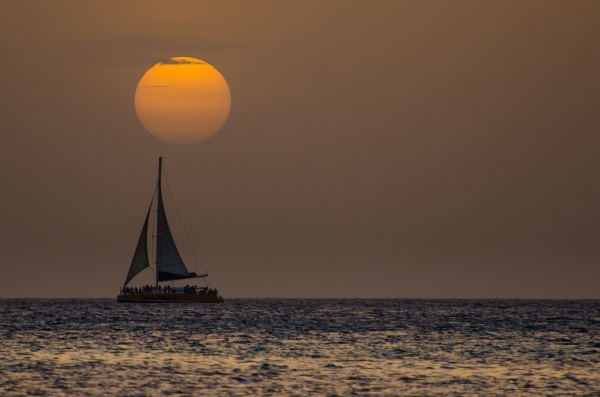 One of the best ways to enjoy Aruba’s spectacular beauty is on a sunset snorkeling cruise. Blue Melody & Black Pearl Sailing is one the most highly rated cruise operators in Aruba and offers some very well selected cruise options as well as private sailing tours. They sail from the Fisherman Pier in the Palm Beach District. Golf lovers will appreciate Tierra del Sol Golf Course, a championship course with stunning views of the coastline. This golf course is part of the Tierra del Sol Resort which offers a full range of amenities including a pro shop, lessons, and equipment rentals. Alternately, the Divi Links in the Palm Beach district, or Aruba Golf Club near San Nicolas are both good options for a casual nine hole round of golf. A good choice for those interested in a personal day trip off the beaten path is to hire one of Aruba’s resident tour guides. Two of these locals known as Cerry and Bully stand out for the positive reviews they’ve received from past visitors. They can take you around the island at your own leisure and let you in on some of the island’s most interesting secrets. Another good option for the adventurous is to explore on your own. Many visitors start from California Lighthouse on the northern tip of the island and work their way towards San Nicolas. There are several interesting stops and attractions to discover along the way. Alternately, a Jeep tour from ABC Island Tours is a popular choice. If you’ve found this article useful, please help us out by sharing it on Facebook & Twitter! Have a great Vacation in Aruba!